By Costa Maragos Posted: November 27, 2017 8:00 a.m.
Endocrine disrupting chemicals (EDCs) are associated with a number of possible health issues. EDCs are mostly produced by humans. They’re found in all sorts of things from pesticides and herbicides, and from cropland and livestock waste effluents and municipal and industrial waste to personal care products. The more climate changes, the greater the concern that more EDCs may wind up in our water and the greater the risk of exposure. That exposure to EDCs can occur from any number of sources, through the food we eat, the air we breathe, and through our skin. Possible long-term effects of EDCs include their ability to interfere with hormone systems that can cause cancerous tumours, birth defects, impede fertility. 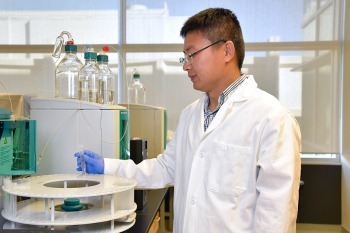 Research, led by the U of R’s Dr. Chunjiang An, is underway examining the environmental risks of EDCs in surface water on the prairies. An is Adjunct Professor in the Faculty of Engineering and Applied Science and Laboratory Scientist in the Institute for Energy, Environment and Sustainable Communities at the U of R. His project, with funding from a Natural Sciences and Engineering Research Council (NSERC) Discovery Grant, aims to develop effective tools and strategies to determine the effects of EDCs on prairie watersheds and ensure the safety of the water supply under changing climatic conditions. We spoke with Chunjiang about his research and what it means at a local level, as well as more broadly. Research indicates that there are increasing concerns over risks arising from the widespread distribution of EDCs. What are the risks generally, and what about on the Prairies? EDCs are considered as emerging contaminants which can adversely affect reproductive performance and immune function. There is strong evidence showing the potential of EDCs to cause endocrine disruption at environmentally realistic exposure levels. EDCs not only have harmful effects on the ability of organisms to reproduce, but also affect a wide range of behaviours, including activity, motivation, communication, aggression, and other abilities. The existence of EDCs in surface water is a common problem in Canada. It has been reported in a number of previous studies. The testing of surface water in Saskatchewan will be our work in next step. Current work in labs focuses on the behaviour of EDCs in a simulated aquatic environment with a context of Saskatchewan. Weather, among other things, appears to affect how and where EDCs wind up. Your project is investigating how the changing climate affects the distribution of EDCs. What’s the connection? Substantial evidence has demonstrated that weather plays a significant role in changing the fate of organic contaminants. Weather influences the transport and dissemination of organic contaminants via rainfall and runoff, which are also influenced by temperature, land use, soil type, and agricultural practice. Under a changing climate, higher rainfall and flooding can increase the amount of EDCs in an aquatic environment via runoff and wastewater discharge. Climate change is now recognized as one of the most important environmental issues facing the prairie provinces of Canada where the Rocky Mountains and undulating prairies affect local climates significantly. It is therefore critical to develop state-of-the-art tools for investigating the effects of climate change on source water quality and to identify the key components of surface water protection strategies. At a policy level, what is the potential impact of your research? 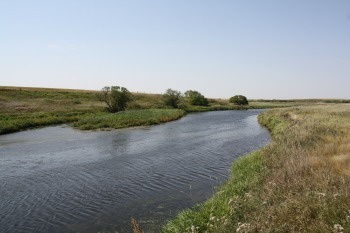 The findings of this project have relevance for regulation development in the areas of water quality and climate change. This project will considerably contribute to filling the gaps of technique, regulation, and policy in emerging contaminants management for water supply systems in a Canadian municipal context. It is also expected to extend the developed methodologies to multiple water types and multiple regions nationally and internationally. Practically, what will your research add to the body of work already done on EDCs? The research team is sampling surface water for EDCs from prairie watersheds including Wascana Creek. This research represents a unique contribution to methodologies for supporting environmental management of emerging contaminants under changing climatic conditions. A set of methodologies for characterizing the fate of EDCs in surface water, as well as mitigating the risks through appropriate water treatment and management techniques will be developed. It will provide technical support for tackling challenges of contaminant transport, toxicity analysis, risk assessment, and their integrations in relation to climate change. In addition to NSERC funding, An’s research received support from the Institute for Energy, Environment and Sustainable Communities and the Faculty of Engineering and Applied Science. 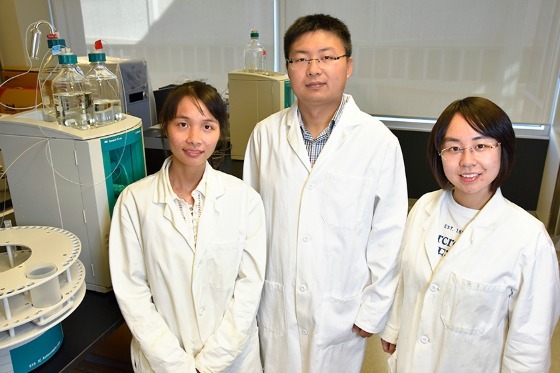 His research is being conducted at the facility of Dr. Gordon Huang, which is supported by CFI. The research is also being supported by Canadian Light Source.